That means rural Texans who are going into labor or having a heart attack have farther to go — and longer to wait — to get the care they need. And it means that good health care jobs and tax tax revenues are disappearing from these communities. Rural hospitals face various challenges, but one of the major budget difficulties they face is that Texas has the highest uninsured rate in the nation. Why does the high uninsured rate make it harder to keep rural hospitals open? Simply put, it’s very difficult for uninsured patients to pay their medical bills, so the high uninsured rate causes financial challenges for hospitals throughout Texas. And that’s especially true for hospitals — like those in rural Texas — that already face a budget crunch. Why is the uninsured rate so high in Texas? Many construction workers, cooks, child care workers, and other low-wage workers don’t receive insurance from their employers and don’t make enough to buy insurance. They also miss out on insurance if they stay home to take care of a baby or other family members while their spouse works in one of these low-wage sectors. In states that have accepted Medicaid expansion funding from the federal government, those workers can enroll in health insurance through Medicaid. However, Texas leaders have not accepted the Medicaid expansion funds yet, meaning that for the most part the only low-wage Texas workers who can enroll in Medicaid health insurance are seniors, pregnant women, and Texans with severe disabilities or near-death illnesses. A new national report shows that Texas could take an important step forward in supporting rural hospitals and reducing the uninsured rate in rural Texas by accepting Medicaid expansion funding from the federal government. The report by Georgetown University’s Center for Children and Families and University of North Carolina’s NC Rural Health Project found that the uninsured rate for low-income citizen adults living in rural areas and small towns dropped sharply from 35 percent to 16 percent from 2008-2009 to 2015-2016 in states that accepted Medicaid expansion funding. On the other hand, in states that still haven’t accepted the funding, the uninsured rate for the same population declined only slightly, from 38 percent to 32 percent. Texas has experienced a decline in the uninsured rate during the last several years (with the exception of last year) due to the Affordable Care Act. 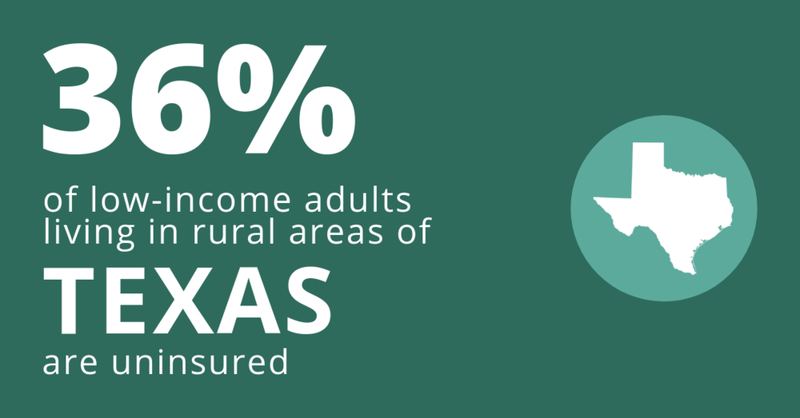 However, the report found that there has been far less progress in rural Texas: the uninsured rate for low-income adults in rural areas of the state only improved by four percentage points, while metro areas of the state saw an improvement of ten percentage points. The report shows that Texas low-income adults in rural areas and small towns are more likely to be uninsured (36 percent) than their low-income counterparts in Texas metro areas (29 percent), suggesting that rural Texans have more to gain if Texas accepts the Medicaid expansion funding. ﻿As part of their strategy for keeping rural Texas hospitals open — and addressing numerous other challenges facing the state — Texas leaders should accept Medicaid expansion funding and reduce the state’s sky-high uninsured rate everywhere.